I can't recall where I first saw this....it's been a very long day! This video is from 2014, but the revelation is totally new to me. I have researched the Nazca lines quite a bit but wasn't aware of this amazing discovery until now. Were they charting the world thousands of years ago at Nazca? ls this the answer? The Nazca lines extended out over the earth look like a modern day map or globe. Angkor Wat is the key. Any set of lines starting at the same place are going to intersect at the opposite end of the earth, but is there a set of more famous lines? And do any converge at the other end of the earth at a very ancient sacred temple? Case Closed. l need a new mic. Don't sit on your headset/mic. I don't mean to inundate you with videos that come with limited view-time ~ I'm taking the opportunity to use up my "gifts" which expire at month end. I haven't seen this one yet; please access the video via the link below, free to view over the 48 hours. David Wilcock explains that the end-times' prophecies, in certain ancient scriptures, accurately depict a world similar to ours, today. This is a time when we are all held in a collective dark night of the soul which brings upon a massive crisis, just before the final breakthrough to ascension. These prophecies also predict the arrival of an avatar, with eight super-human faculties, who will usher us into a new golden age of peace, prosperity and ascension. 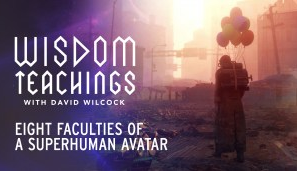 This presentation by David Wilcock was originally webcast August 21, 2017. Thank you to Ke El for posting this. 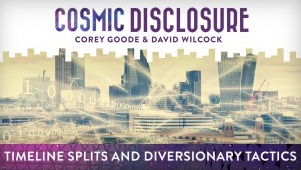 Corey Goode’s experiences with the secret space programs continue as he returns to update us on the rapidly changing circumstances concerning disclosure and conflicts between the Air Force and the Navy. Several Nordic groups are breaking away from the Mohammad Accords and may begin reaching out to humanity. Rob Potter asks some good questions and got Cobra to report on the status of the Chimera and Archons. Cobra reiterates that Yaldabaoth, the Black Stone and Toplets (as they are all intermingled energetically) must be taken care of before The Event. There's also positive confirmation of good progress in Syria, and some reporting about the North Korean situation. Cobra's information about the ancient vedas being a mix of truth and disinformation is also interesting, given that David Wilcock has covered something based on the Mahabharata in his Wisdom Teachings' new season (posted here). Once again, Cobra explains that The Event needs to happen before the Financial reforms/reset. Please read the transcript or listen to the audio at The Promise Revealed. I've come across some reports that Harvey is the result of Haarp (see note at the bottom); in this update, Lisa Rising Berry explains from her perspective that it's not. I do not know what the truth is, so please go with your Higher Guidance, as always. Also noted is Lisa's mention of Mother Gaia going into warrior mode, something I had written about a pre-Eclipse (here). I personally do not see Harvey as a direct "retaliation", but I do agree that we have gone into a re-balancing phase. I will also confirm that I've heard from some about being under attack (including me) around the time of the Eclipse, but as I've said before, they are nothing as severe as that in 2012. But before I go into Harvey, I would like to share my personal experiences on the day of the solar eclipse, and as well as past eclipses. 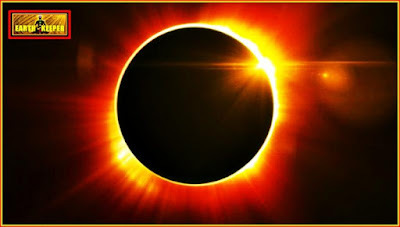 I have always suffered during every single solar eclipse – not emotionally in the physical world, but psychic suffering. It’s the kind of suffering that the majority of people don’t understand and think you’re nuts if you bring it up. During each eclipse, I would be psychically attacked…full on scare-the-crap-out- of- you attacks. I experienced these attacks in my lucid dreams as well as when I was awake. When I was awake it would feel like bees stinging my body. I would have “things” in my dreams chase me into my awake reality. Some of them would pull the covers over my head in the astral and try to suffocate me. My husband witnessed this happen once. He saw the covers over me sink. He said it was clear that something was on top of me. It was an entity that I was fighting during an eclipse that followed me to my room, jumped on me and tried to suffocate me on the astral and in the physical. I knocked it off of me and started gasping for air. I didn’t realize why eclipses were so hard on me until I learned more about the nodes of the moon and Rahu. My soul has a long dark history with this ex-demon. I fought the fallen corrupt demons and dark entities. HOWEVER, this was the first eclipse that I did not get severely attacked. And this is due to the shift in power when the nodes of the moon moved to Aquarius and Leo. I have written articles about how Rahu is no longer an energetic presence on the moon. Only his name remains. So, despite my horrible history with having to fight Rahu and others during eclipses, I decided to face my fear and hope for the best. Even though I absolutely know the Rahu energy is gone, there was that little “what if” in the back of my mind. I was advised by my dear friends to stay inside, but I decided to sit out in the sun and do my spiritual practice. I became fearless. If there were any pieces of Rahu left coming from the moon, I was positive if I sat outside in defiance they would come and get me. I sat there like a big juicy worm, waiting for any last remnants of Rahu to come and take a bite of me. Everything was fine for awhile. 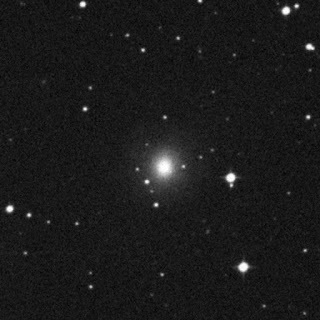 I saw the dark feminine energy rise in pulses, then it formed a big ball of whitish light. Then I saw a portal trying to open, and it did not feel good, so I thought…OK, here we go. I was watching the eclipse with my son, who is even more clairvoyant than I am, and he was keeping an eye on my energy. He offered more visual confirmation for me. We both could tell this portal was being opened by two groups of people. One group was not from any entity on earth, but the other – the other truly shocked me. This second group was humanity on earth! The first group has the ability during a solar eclipse to enter without permission. They can come in through a back door. They took advantage of the fear and confusion earth’s humanity was feeling. This fear and confusion was coming from the USA. These groups do not like the shift of the dark feminine energy. This “Kali/Lucifer” energy has not been present in all of its glory for at least 2 precessional cycles. (which are 26,000 earth years each). I watched this portal try to open, and I felt myself and others close it down. When I started to participate I was attacked three times. Yes it was painful, because it feels like bee stings. But it was really nothing like I used to feel. I was happy to feel it because the portal was closed. On a scale of 1-10, the pain from this portal event was a 3. It really was not a big deal. I have experienced what I consider 10s before. 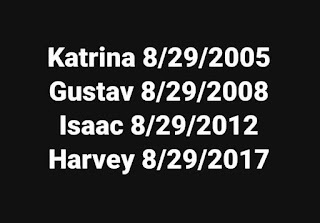 I've come across some reports that already say Harvey is Haarp-engineered, or manipulated otherwise. I also saw this interesting image below (taken from here) that's quite telling. 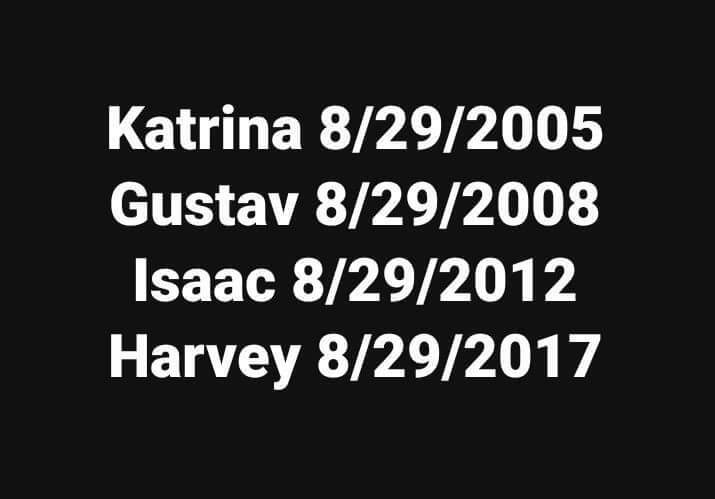 A quick check confirms that these hurricanes did occur over the common date of 29 August. This eclipse season was history in the making. The theme of August is the Dark Divine Goddess. Their are many names for this consciousness such as Kali, Lilith, and Lucifer. These are just a few. There are many more, but the name is not important. It is the energy that is important. The dark side of the Divine Feminine is not evil like it has been made out to be. Society has been brainwashed to fear this energy. 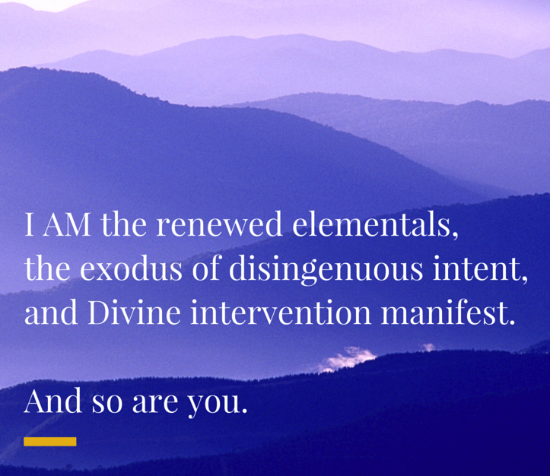 It is destructive energy from the heart. It is known as the destroyer, but with compassion. You cannot create without destroying what no longer works first. If you build on the old, you will have the old with some extra pretty colors, but it is still old. To start new, the old must go. You will see through my article how this unfolded during this entire month. Since the theme is the….”The Rise, Release And Balance Of The Demonized Dark Feminine”, it creates a lot of fear in people. Everyone wanted this energy to arrive, and now that it is here they are changing their minds. This energy is still balancing. It was a prisoner for eons and was just released the day of the solar eclipse. Imagine you where held captive for what seemed like forever, and you just got your taste of freedom. How would you feel? How would you react? How could you trust? She was more balanced before her release because that is what she had known for so long, and she got used to it. This Dark Goddess energy is like an abused animal, shaking and weeping. She is thrashing around releasing all of her pain, then she will calm down and basically collapse in a heap. Then the healing will begin. My second article will be on Hurricane Harvey. This eclipse season greatly affected this weather system. This all started for me with a vision I saw with my eyes closed in my altered state. I saw two infinity symbols side by side, then a line underneath of both of them, then two more infinity symbols under the line. (Please excuse my humble drawing.) I had zero idea what it meant, but I knew it was about August, which is the 8th month. I then realized that the eclipses where together with two more important dates. The lion’s gate and the 8/22. First I will do the numerology for all four of these dates which shows the correlation to the rise of the Dark Feminine from two different aspects. It is interesting how the number 2 plays such an important role. There are two aspects to the Divine Mother energy. One is creative from the heart, and one is destructive from the heart. Our ancient texts, or "myths" as we have been conditioned to believe, hold far more truth than some history books. David Wilcock goes back in time to retrieve parts of Hindu vedas such as the Mahabharata, and brings them into current context. 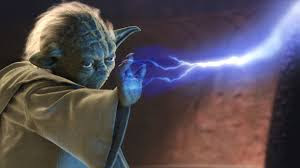 He also sets the stage for future references to a Solar Flash "at the end of the Yuga", obviously referring to our transition from the Kali Yuga to the Satya Yuga, or the Golden Age. Ancient texts suggest that Earth was once the battleground for multiple extraterrestrial peoples, with burgeoning human civilizations caught in the crossfire. These scriptures describe a world entirely different than the one we are most familiar with, filled with non-human beings. David Wilcock explains that these accounts may have been written in a time before the Earth shifted on its axis, giving our planet an entirely different climate than we have. A dominant culture in this raging war was an aggressive reptilian race that we now call, the Draco. 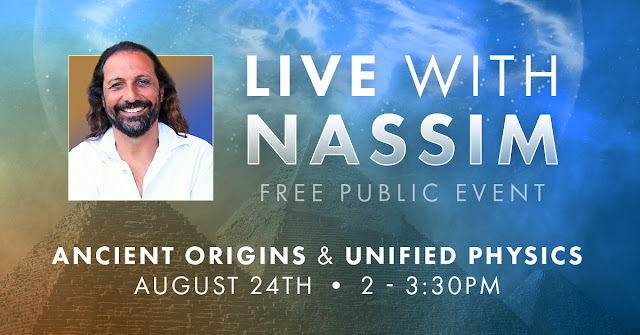 This program with David Wilcock was originally webcast August 14, 2017. While this episode may not be ground-breaking for those who are already familiar with Hindu vedas, it is nevertheless a nice start to this new Wisdom Teachings season. It's been a week since the Total Solar Eclipse, and each day brings with it more clarity for us to acknowledge, accept, and interpret according to our own individual understanding and purpose. Prior to the Eclipse, I had absolutely no intention of comparing it to the 2012 December Solstice and the thought didn't even cross my mind, yet that was precisely what I inadvertently found myself doing. I held no expectations going into the Eclipse ~ except for needing to be home-bound in solitude ~ and yet, I was surprised by all I experienced. Over the first three days of the Eclipse, I had a headache (no migraine, thankfully!) that came and went, accompanied by mild nausea. I had to lie down often and sometimes ended up having 15-minute naps. Apart from the physical discomfort, it felt like Mother Gaia hit the "Pause" button for all Life on Earth, while the rest of the Cosmos got busy doing what they had to do. Lots of activity in the midst of the stillness; a void that was filled almost to bursting point. I'm not trying to sound Zen-like here, that's the best way for me to describe it. Divine Dichotomy.....It's like a colicky infant finally falling asleep, and everyone is scurrying around trying to get things done before it wakes up and starts wailing again. We've been propelled once more onto a "higher" strata of existence. And like the other cycles before this, it's a "new" new ~ we're always landing on a new platform as we advance along this Ascension path but this one is quite a leap. One of the side-effects of this Eclipse is the exponential amplification of something many of us have been feeling rather strongly for quite a while now ~ being increasingly out of alignment with the current reality. This isn't a very fun feeling at all, and can at times be very uncomfortable with a degree of bleakness. We no longer feel "right" in the old, and we are actually becoming aware or "seeing" that it will not be able to sustain its existence for much longer. How I see it is that the "warping" of this reality is becoming more "loose" ~ as if the threads that are holding it all together are beginning to fray. There were a number of reasons why I found myself thinking back to 2012, which I will expand on. In 2012, the first three days of the December Solstice felt very hazy and dream-like. I was neither here nor there ~ it felt like there wasn't "anywhere" to be. However, during the first three days of the Eclipse, I felt very present (notwithstanding my physical discomfort) and it was as if I could feel the stillness, the accelerated activity, the emotions, and yet remain neutral for the most part. In 2012, it felt that we got to where we were supposed to be, but once we "arrived", there was no one waiting! It was as if we had to break through a boundary (the time-loop) and it didn't matter where we landed as long as we broke free (we did). Where we ended up was uncharted territory that was yet to "exist". There was a place to land, but it was totally new and "empty". It was generally touch and go, with many unknowns and even more hastily made-up last-minute preparations in the Higher Realms. No one really knew for sure what would happen. After the Eclipse, we generally arrived at the place specially prepared for us, complete with a happy welcoming committee. It's a transit lounge because we're not meant to stay for long. However, we're not there in sufficiently great numbers yet ~ they're still calling for passengers to get to the transit lounge so that the rest of the journey can resume. We're still arriving in dribs and drabs, albeit at quite a steady rate. So in a sense there's this pause, but lots of activity going around, generally quite ordered and with a strong sense of purpose. We have definitely arrived somewhere very new, and many sources have already said that. 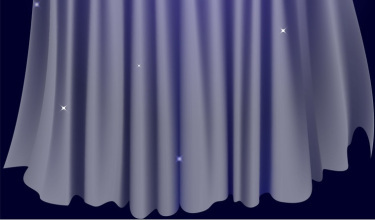 However, this isn't a back-to-business-but-bigger-and-brighter scenario ~ it's something altogether....well, new. 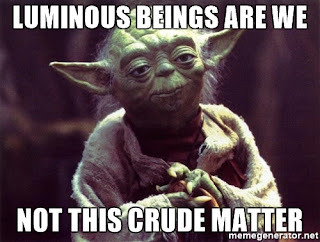 Not just an improved version (perhaps for the interim only) but rather a reality-shattering, belief systems-busting, thought-altering creation, and we are the ones who have to create it, moment by moment. Life as we know it, which is actually anti-Life, will have to completely change so that we can embrace True Life in every aspect of being. We're not renovating the house to improve it, we're building from the ground up, upon an entirely new foundation. The new building isn't even remotely anything like the old. The architecture is something out of this world (it is! ), there's room to accommodate everyone, with comfortable and nurturing surroundings, and the technology is truly advanced, unlike the poor mockery we have now. 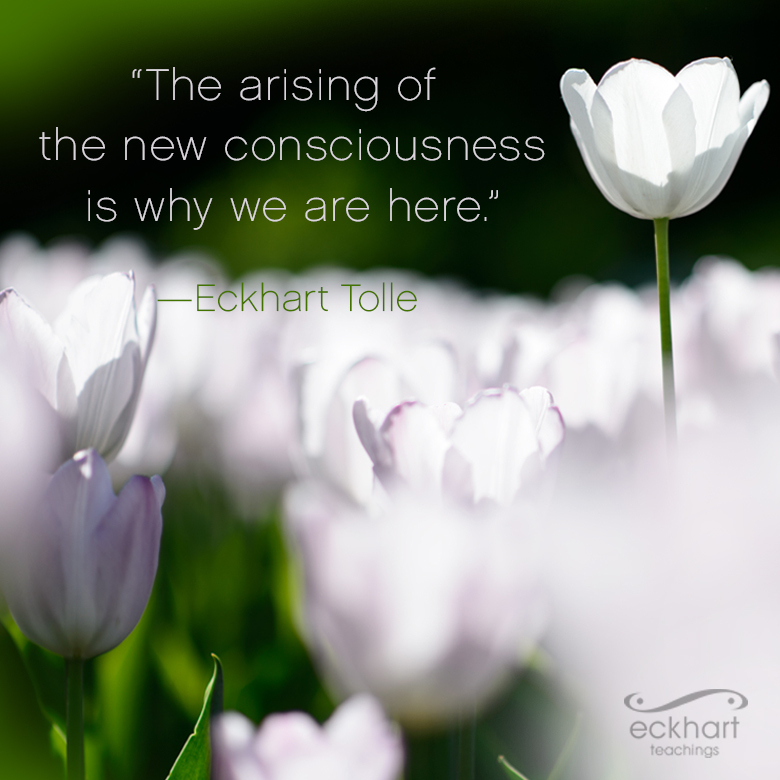 We will need to step into our Higher Consciousness to create our New Reality because it cannot be created from anything but True Consciousness. That's why I said that our New isn't some improved version of the Old. We're going through an all encompassing Cosmic Reset of ultra-epic proportions, or Universal Re-write as Sandra Walter calls it. Starting all over again, from the ground up, as Higher Consciousness Luminous Beings, as Galactic Citizens of the Cosmos. In the classic "Silmarillion", discord (anomaly) crept into the Song of Creation - this ultimately showed up as darkness that overran Middle Earth. Source is now sending out a new Symphony of Creation across the Cosmos....and this time, it's in Perfect Harmony. Light-capped mountains attract the masses. Inner strength discovered, humanity rises. Florals are gathered for the celebration. Long Island Meditation details here. 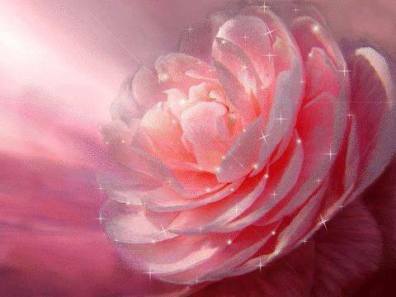 Weekly Ascension Meditation ~ details at the fb page, or at The Portal. Are they describing what we think they are? Beyond Black Holes: Could LIGO Have Detected Merging Neutron Stars For The First Time? Let's also remember Dr Paul Laviolette and his pioneer work on the Super Wave. Thanks to Wagosh Fox for posting the first link right at the top. Today’s eclipse represents the emotional and energetic harvest for all the hard work so many lightworkers and earth angels have been doing over the past many weeks. 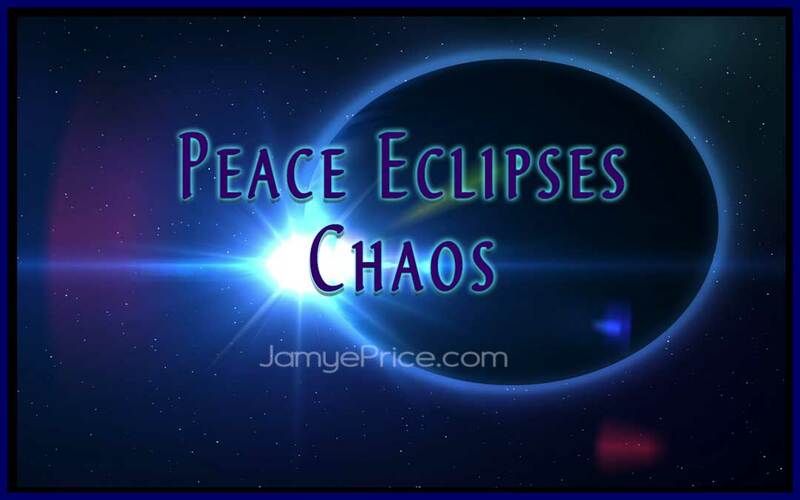 For many years, energetically-sensitive souls have laid the crucial foundation for the energies that today’s eclipse celebrates as the further unveiling of unity consciousness. So much of the old carbon-based DNA has been transmuted, while new strands of crystalline DNA have been activated over the past many years to allow today’s energies to begin a process of synthesizing our energy fields into greater harmonious alignment with our physical bodies. 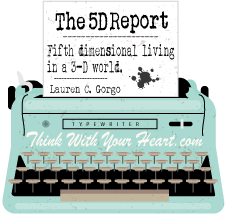 As a result, many of us may be feeling the surreal serenity, peacefulness, awe and wonder of these new energies, as the 5D realities many have been experiencing on the inside begin expanding outwardly to take shape and form as a 5D world. For some this shift will be instantaneous, and for others, quite gradual and subtle. 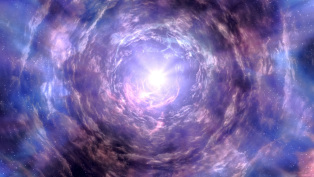 And for the remainder of the population that may require greater adversities, losses, changes, chaos, and turbulence, in order to turn inward and align with these frequencies, those rooted in 5D will hold space as heart-centered anchors and transcendent observers of an evolving new paradigm. 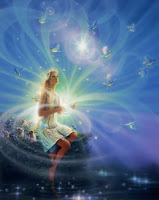 As the eclipse welcomes energies of both completion and renewal, it is a time to set intentions that fulfill your highest spiritual purpose, as well as your deepest personal desires, since the field is easier for many to access during these phases of amplification. It is a time of existential rebirth, where you have the opportunity to clean the slate and begin a brand new relationship within yourself. While there may be pains from the past or characters that represent healing still in progress, today can be a day of greater forgiveness by letting yourself off the hook. May you allow the incoming waves of amplified energies to align your energy field with your physical body through the soft and gentle joy of an open heart. 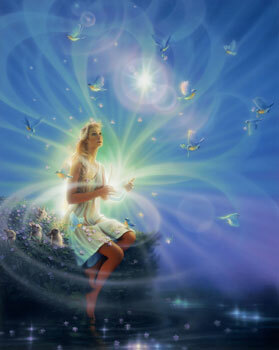 May you meet yourself as the angel you’ve been waiting to receive contact from. May you become the inner voice of encouragement who urges you to live as if you have nothing to lose. May today be a chance to reach inward and touch the depths of your own innocent nature more profoundly than ever before. The August eclipse has had an interesting flow. Now that it has occurred, the information I was receiving prior is much clearer. First a little background, so that we are aware of the opportunities and challenges as well. It was a powerfully positive energy! In the August monthly energies video and article, we were shown the amplification of connective, loving intent as our infinite Love ignites. We also covered some of the negatives that the eclipse has the possibility to help us reset. The Charlottesville protest and was a loud indicator of what is surfacing for healing. One facet. When you look for the clues of improvement, you see that humanity is awakening into more peace. It won’t happen overnight and it won’t all be easy. But peace is igniting. It is the core of what the masses want, but the masses have not previously understood their power clearly. The astrological assistance has been pretty consistent for years of stirring up the power systems that have suppressed the soul of humanity from igniting more Love into the world. Those systems aren't letting go easily, but change is inevitable. The current energies offer us a renewal of intent to focus the future. When the eclipse occurred, the energy was palpable. 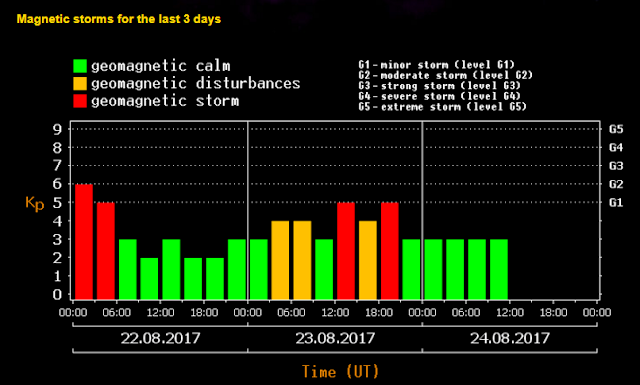 I was genuinely astonished at the difference in the energy. As it began, there was a stillness and peace. I listened to birds chirping, feeling that beautiful peace and I felt the collective call. 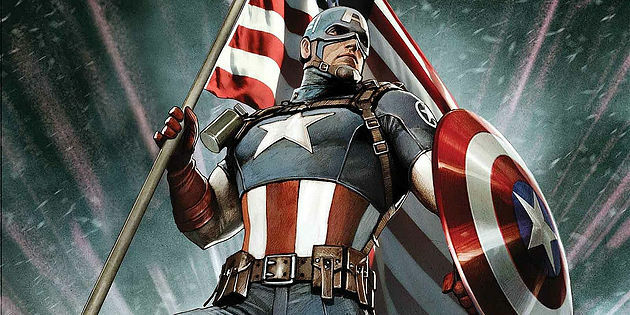 It was interesting, because there has been quite a bit of turmoil in the collective energies leading up to it. The lunar eclipse surfaced what was beneath, and the solar eclipse brought Light deep within. The energy was crystal clear. Peace will prevail. Since the powerful Solar Eclipse last Monday, its time to integrate the Eclipse upgrades into our biofield. This may be sweeping through the body in many ways…causing you to feel wobbly, light-headed, woozy, exhausted, weepy, and/or anxious. I’m finding it helps to get outside, feet on the land, breathe deeply and ground the upgrades daily until the energies have settled inside. With every step I take outside I set the intention to ground the eclipse upgrades into my being. The intense Light surge is pushing up shadow from the depths of your being, up to the surface for release. Like ‘oil on water’, the shadow emotions, thoughts, memories and patterns are coming up for healing and clearing. Liberate yourself from the past! Salt baths also help balance any electrical over-stimulation in the body. Due to the Eclipse upgrades, there is deep molecular transformation occurring. While in meditation, stretch your auric container to hold more and more Light consciousness. Feed the brain, neurological network and mitochondria more Light! The Eclipses are adjusting your electromagnetic field from extreme polarity into a harmonious field of ONEness. As polar opposites blend and balance within, you electromagnetism becomes smoother, less push-pull, more adaptable and pliant. You are moving into 5D Unity Consciousness. We will be broadcasting the New Earth Central show on Wednesday, September 6th to assist with the Eclipse upgrades. 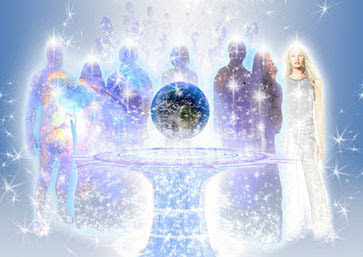 The focus for the coming weeks is integration as we prepare for the Equinox Stargate on September 22nd. This is a brief update since the August Gateway passage is not yet complete. It has been a busy phase for us, and the Solar eclipse was a very unique shift in consciousness – on both Global and Galactic scales. – Receiving the Christed Crown: This was palpable for me. Active needle-like sensations on the crown, with bright auras of light around the head during and after the eclipse. – Plenty of High-Heart thymus fluttering, heart opening during the eclipse peak as well. Absolutely blissed out and transfixed by the end of the Gateway focus. – The light rays beaming the Ascension column brightening and expanding to merge several dimensional expressions. 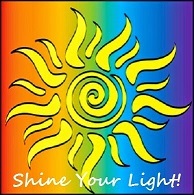 Gateways to the New Earth consciousness experience opening, brightening. – The deep peace of zero-point stillness as the Cosmic Stargates converged, which continues to deepen. The sensation is a merging with Source-level through the Heart; stronger than any heart activation or connection I have felt before. Again, it feels out of time-space dynamics. – Visions of the eclipse path lighting up and distributing the activations through the New Earth grids, sacred sites, and HUman heart grid. From point to point along the path, to every crystal placed by a Gridworker around the globe, everything lit up like stars. Ancient encodements activated through the crystal beds and aquifers. 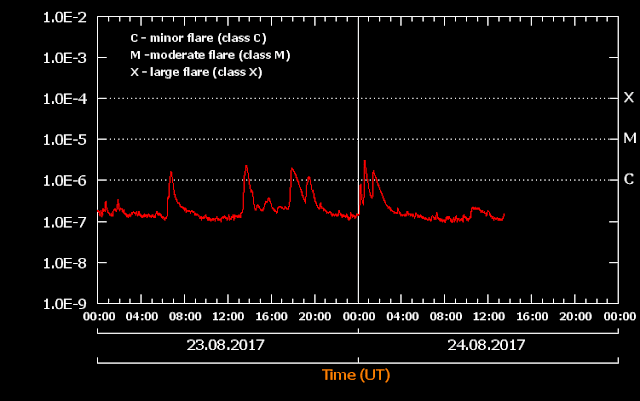 The crystalline grid jumped to another level as well; it, and my Higher Team, looked as brilliant-crystalline as Solaris during the eclipse. Yes, I glanced directly at it for a second, a few times, without the glasses. Pure Diamond-Photonic Light. Sorry, I just noticed this in my Inbox. There's about 4+ hours left if you are interested to sign up, it will be recorded for later playback if you can't listen in live. 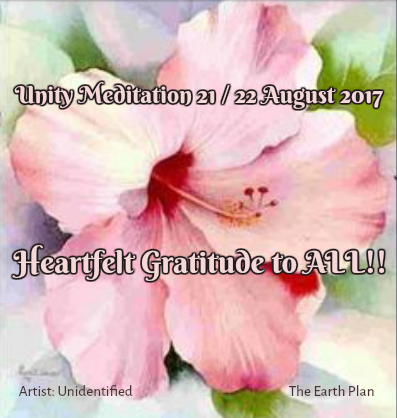 Firstly … CONGRATULATIONS to all of you … the United Continental Army of Lightworkers … for stepping up to the plate … for throwing your full transmutational weight behind this massive effort to free the planet, yourself, and your loved ones! YOU … were so needed! The preliminary report from Cobra (first-hand off-world information) is positive & very encouraging. We now have to let the inevitably massive amount of dust to settle, to see where everything landed. from the space of Omnipresence, (yes … I know Omnipresence & the word ‘space’, is an oxymoron. But you know what I mean). How this was done, and ‘why it was never done before’ … is also explained below. I’ve done my best to keep this report as short & succinct as possible … but it was a FREAKING BIG CLEARING … As you’re about to find out. I wanted to post the SR chart earlier today, with the comment that it's rather "quiet", but just didn't have the time to get to it as family duty called very loudly....then I just saw this! 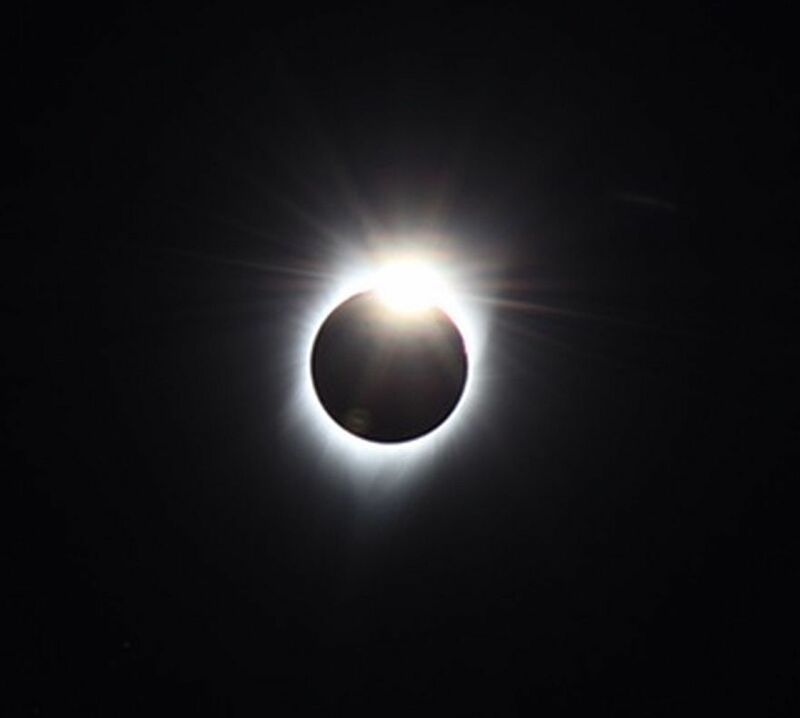 We just witnessed the second eclipse of the season, the total solar eclipse which was being touted “the great American eclipse” due to the fact that it’s over-lighting essence was the most powerfully felt (geographically) over the United States for the first time in nearly 100 years. 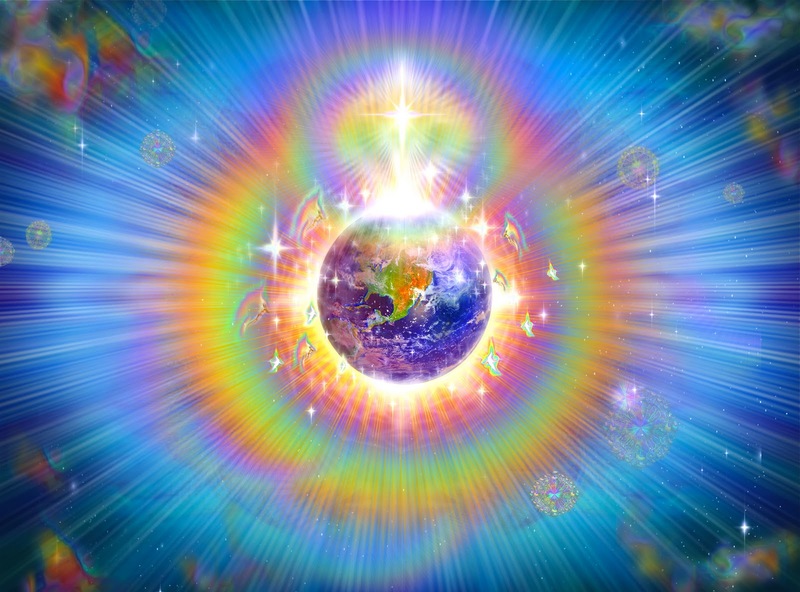 The effects of this event will be felt everywhere for a while to come, but for those awake and in tune with the greater Plan those effects are being felt largely inside as a major inner-light encoding. To experience an eclipse internally is to be aware of the activations and DNA upgrades taking place and the effects those changes have on our every level of our being. This particular eclipse took place in the sun’s sign, Leo, which is THE archetype for the inner-ruler and is therefore so central to our sovereignty…to our independence and freedom as Self-governing souls in full conscious command of our destiny. Think about the millions of people who were focusing on the sun all on the same day…thinking about it, talking about it, hearing about it, looking at it, feeling it…a HUGE collective chunk of human conscious (read: creator power) immersed in the energy of what looked to be “the” sun, but that was ultimately awakening “our” (inner) sun, en masse…speaking directly to our very own so(u)lar power. Can you imagine what will come of this collectively shared intention? Those who have prepared themselves to take this major step into the full expression of inner-authority have been consciously working with this energy to move vibrationally outside of the “human slave race” frequency matrix, to eclipse the insidious control mechanisms put in place by those who have a vested interest in our consciousness, in our life Force, in our heart power. This whole year in fact we have been reclaiming the sacred powers of the Holy Heart for exactly this reason..because the awakened human Heart is quite literally the only threat to the powers that were. They may have more advanced technology and more advanced intelligence, but what they do NOT possess is our innate ability to Self direct our life force, to transform our reality and the experiment of this world thru our own remembrance of LOVE, thru our own willful desire to take full command of our brilliant biocomputers. A lot of amazing progress reported by Cobra! Imagine what we can do if we continue to speak in One Collective Voice on a regular basis! A few million people were informed about the meditation with more that a quarter million actually participating, so it was our strongest meditation ever. The unity and the resonance we have achieved was remarkable and was a signal for the Central Race that the awakened part of the human population will be able to hold the Light in unity when the Event happens and that it is now time to put this planet through the Ascension process. This means that from now on, the energies from the Galactic Center will exponentially intensify until all darkness is purified and the planet is liberated. During the meditation, the critical mass of the New Atlantis energy grid around the planet has been completed and from now on this grid is strong enough to handle the energies of the Event. From now on, the New Atlantis energy grid will be used by the Light forces to transmit mission activation codes in the form of revelatory dreams, impressions and visions to the awakened part of the human population. More that half of the remaining plasma anomaly of the Yaldabaoth entity was transmuted, and the East Coast plasma anomaly vortex is virtually gone. What is remaining are smaller fragmentary decomposing plasma anomaly vortexes in Washington DC and New York. The Archons were occultly using the East Coast plasma vortex to protect the Cabal and with this protective cover now nearly gone, many actions of the Cabal, including their extensive child abuse networks, will be soon exposed to the general population. The Light Forces were very active in the last few months to remove the Black Stone, and our Unity Meditation gave the needed energy support for the final push, and now the Black Stone is nearly gone. It will be completely cleared within a week, and all anomaly associated with it within a month. When that happens, the RHIC collider on Long Island will lose any meaning for the Chimera Group and they will stop using it. Thus it will become just one of many colliders around the world, incapable of doing serious harm to humanity. I Am in the new, I Am in the new, I Am in the new. 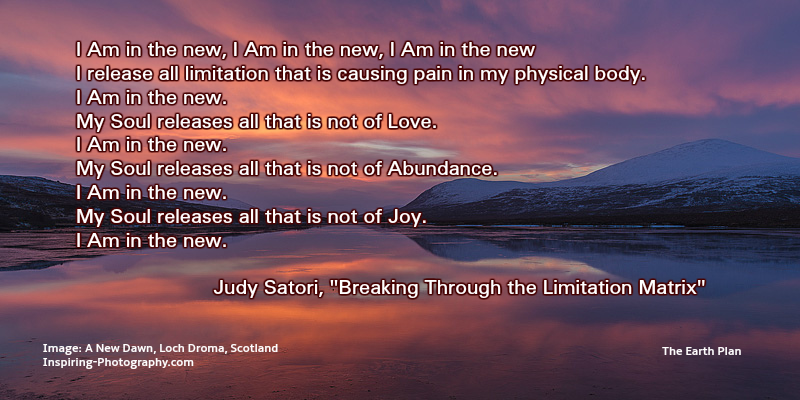 I release all limitation that is causing pain in my physical body. I Am in the new. My Soul releases all that is not of Love. My Soul releases all that is not of Abundance. My Soul releases all that is not of Joy. 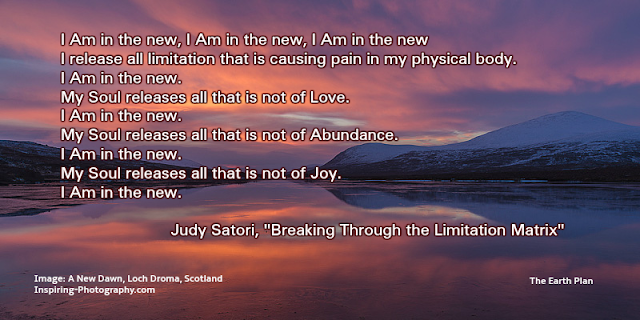 ~ Judy Satori, "Breaking Through the Limitation Matrix"
I’ve been extra chatty lately, writing articles one right after another, because we’re in such profound change that I feel it might be helpful to some to hear more from me during this major Shift phase. The expected and unexpected, the weird and super weird, the strange and unusual, the quantum nonlinear and so much more is here now but there’s nothing to fear, only understand better from a personal level for each of us. I published my previous article on Saturday, August 19, 2017, because I HAD to for a lot of different reasons. When I woke up Sunday morning August 20, 2017, it was semi-dark outside and I instantly knew I wasn’t in linear time again and to just roll with it, whatever “it” was or will become. I knew I was in the Solar eclipse near full totality, which was “impossible” because 1) I live in Southern California below Los Angles and above San Diego and inland a bit. I knew what I was experiencing wasn’t “normal” but there’s very little that is “normal” anymore, and thankfully after a lifetime of Team Dark stunts and attacks etc., not much scares me so this was just a new adventure to me. [I’m sharing all this because everyone is or will be having their own unique adventures too, both in linear time and in nonlinear quantum time and in multiple dimensions also.] And 2) because the Solar eclipse wasn’t going to happen until the next day, Monday, August 21, 2017! I got up and went about my physical chores as usual, but as the hours past on Sunday the 20th, the semi-darkness caused by the Solar eclipse that was happening the next day, Monday, didn’t increase or decrease but stayed the same all day! I knew I wasn’t in linear time and space but was in some quantum nonlinear Now Moment and to pay attention, Feel, learn, See whatever was available to See from Higher Awareness and so on and just ride this thing out for as long as it lasted, and it lasted all day until the Sun went down. I shouldn’t need to say that it made for a very unusual day that gave me plenty of “time” to move about in, pay attention to, create within, look into quantum No Time. every single effort made a successful collective impact on the outcome! that created this super alignment! After a short intermission, the storms have stirred up again. August is one of the key, transformative months of the year that will move many of us out of our comfort zones and bring us completion on many levels. It's an "Expect the Unexpected" month that will bring huge change. August is full of Wild Cards in which anything can happen. And at this moment, we don't know which Wild Cards are going to be dealt to us. We are experiencing heightened polarities as humanity splits into various divisions. There's the ever growing separation between those living in the two reality systems of Duality and Oneness. There are the obvious divisions between religions, races, political beliefs and between the rich and the poor. Splits within splits are taking place. It's become increasingly evident that we now live in a world where most world governments put corporations and personal greed above the well being of the people and the preservation of our natural environment. 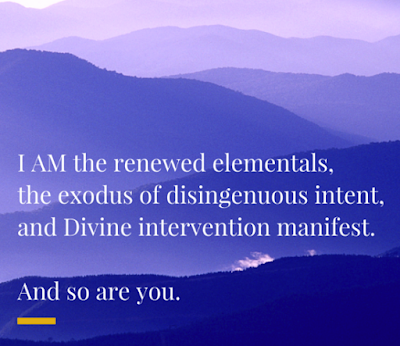 This makes it essential that we now strengthen and enliven our One True Being. If we really want to step into our One True Being, we all have to find our true place within it. We come together as a jigsaw puzzle comes together, piece by piece into its correct position. Some pieces go into the puzzle at the very beginning, like corners and edges, while others go in later when their true position is finally revealed. We don't all try to cram ourselves into the upper right corner. And we don't expect any of the pieces to be the same or to fulfill identical functions. That simply wouldn't work. Many of us have a strong desire to make that final push to completely change our lives by stepping out of our expired beliefs, thought forms, old ways of living and doing things so we can live truer, more fulfilling lives. In August, the chances of doing this are greatly multiplied. There are two eclipses this month ~ a partial Lunar Eclipse on the Full Moon of August 7 and a Total Solar Eclipse on the New Moon of August 21. Every eclipse is a Wild Card of sorts, but these two are especially strong ones. Like a massive display of fireworks, August's eclipses are going to set off a series of triggers on multiple levels. There will be numerous breakdowns, as well as breakthroughs. The playing fields of duality definitely won't be quiet. But at the same time, many will be thrust deeper into the New Reality while experiencing Quantum Breakthroughs. This is a time in which absolutely anything could happen ~ the good, the bad, the impossible, the miraculous, and all the spectrum in between. There will be completely unexpected infusions of energy from "Off the Map of the Known". The veils are being lifted, one after another. Layers of disguises, subterfuges, conspiracies, corruption and manipulation are coming out in the open to be clearly seen. All those preconceptions we had about how it might be, how things might turn out ~ just forget them. The TRUTH is finally being revealed. I saw this vision three months ago, and shared it with a small group of Beautiful Souls. I didn't post it on my blog, because I felt then that it wasn't yet time to do so. However, I'm publishing it now because I suddenly remembered it, and because it feels that it's the right time to do so. 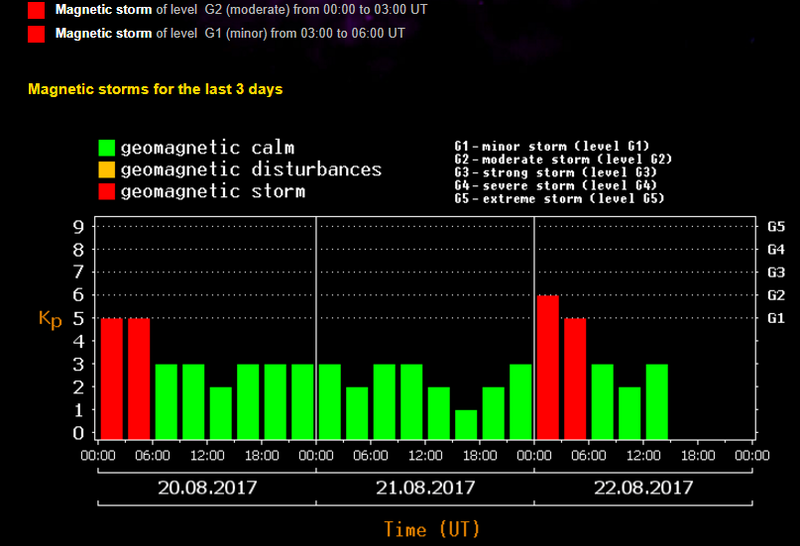 Please don't interpret it as The Event (or even Ascension) occurring tomorrow (or in the next hour) ~ I look at it as another very strong indication that we will be progressing at a much more rapid rate in the very near future. During the meditation just now, I saw Mother Gaia "become" the centre of the Galaxy. Of course, this is symbolic ~ I believe it meant that she was being the focal point. Then a vortex of energy formed around her, swirling round and round. It was as if Pure Energy was being poured into and around her, the energies completely engulfed her. 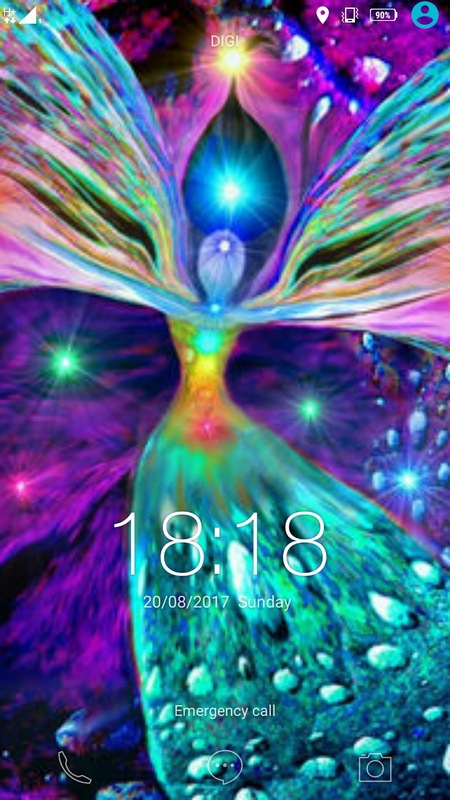 After a while, she emerged from the centre of the vortex.....all sparkly, brilliant blue and shiny! It felt like she had rebirthed herself in the energies of the vortex. The next thing I saw was our bodies getting lighter and "less" (as if "shrinking"). Then a bright thick-banded rainbow formed over each body. This made me think, "Rainbow Body". Finally (I didn't "see" this one, more like "felt"), I had a sense that we were crossing the horizon. I think this is symbolic of going through something very new. The image above doesn't actually depict what I saw, it's just a representation. 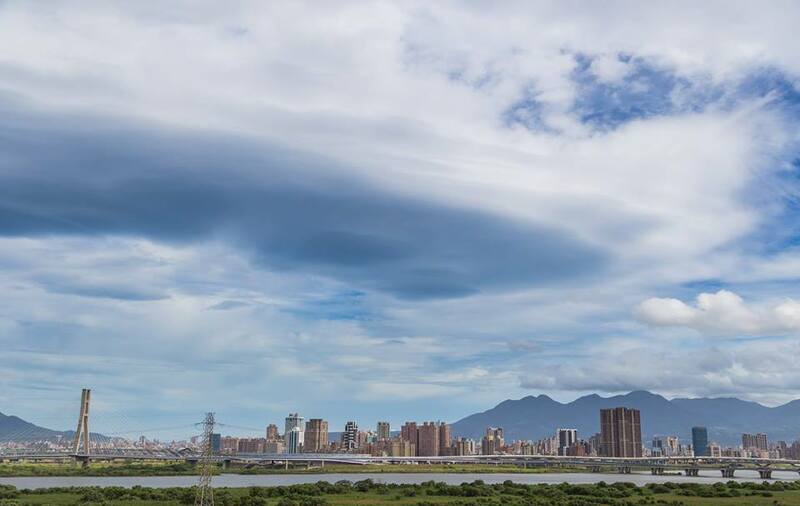 A HUGE MOTHERSHIP showed up in Taipei this morning!! Anyway, this update is due to a series of events over the past couple of days. As with most personal updates, I usually wait for a bit before writing it out, just to see if it actually requires posting. Sometimes there is no strong guidance to share, so I won't, but other times the nagging gets louder, which is the case for this update. I can't believe how fast the last few days have just flashed by. I mean, yes, time is accelerating but in recent weeks it's been whoosh-whoosh-whoosh! And time warp episodes, or "lost time" are getting more frequent. I brought that up because for a moment I had to think very hard about the sequence of events and which day it was when it happened. I recently posted an update with my phone times, and there'll be some more here. What made me take this screenshot is the 18:18 time again. There were two 18:18s in the previous update, so that prompted me to pay attention. On the way back, I did the LI Meditation on the train ~ the timing was such that I only missed 5 minutes at the start, better than not being able to join at all. After that, I knew I had about 10 more minutes left on the train, so I fished out my phone with the intention of finishing the rest of Tim Whild's video, and it showed the image at the top of this post (22:22). During the LI Meditation on the train, instead of visualising the Violet Flame as required, I received Sacred Geometry instead. I couldn't see them very clearly, but what I got was "New Sacred Geometry being sent to the Planet". 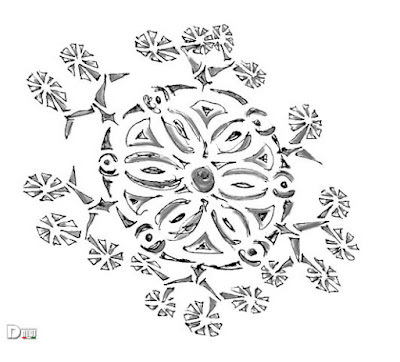 The shapes looked like the Flower of Life, but "different". The only way I can describe them is that they are so beautiful, they shimmered, vibrated, and presented in three-dimensional forms. By the time I reached my home, I knew that we were going to emerge from the Eclipse to a very positive and powerful period. I wasn't even thinking of reaching critical mass, the feeling was so strong and convincing that we would enter into a very progressive phase. Finally, when I saw Interstellar and Siaki's "Seed of Life" just now (previous post), I knew I had to write this update. I won't go into the meanings of these numbers, I know that many of you are very well-versed in them. I did a quick research and I'm encouraged by the overall message ~ we are definitely going into the New. This message made me sit up, and I'll explain why in my own update, a little later. Seed of Life for a New Earth. By Intestellar, drawing by Siaki. We want to mirror a little bit of our energy in this day that could be crucial in the history of the Planet. With this quick drawing, titled Seed of Life for a New Earth, the concepts expressed are the following. 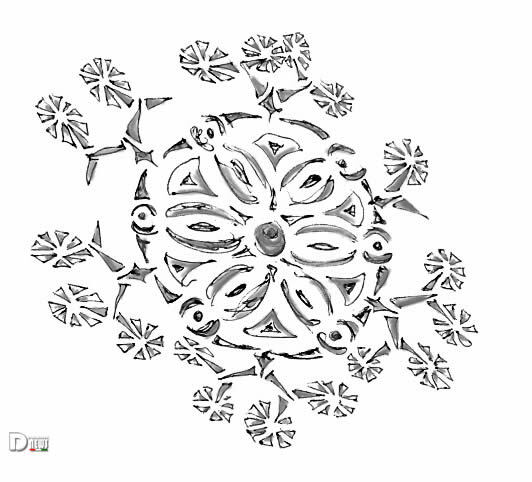 The Seed of Life is made up of 7 Cintamani Stones, representing the Energy Grid of the Planet, a bigger stone in the center and six small in the outer circle. The figures inside the six cotyledons that make up the seed represent the expansion of Energy from the Center (we could interpret it as the Center of the Galaxy). The six outer stones connect to each other to form Planetary Energy Grid connected by Pillars of Light, inside the cotyledons, at the Center of the Galaxy. The Pleiadians report, Critacal Mass Acieved! With that, large cracks in the Veil happened. Not just cracks, but considerable holes. And through these holes more ships of the Galactic Federation could get closer to the surface thanks to the burning down of Chimera devices that caused them, the Chimera, to detect too many approaches of the Federation Ships and as a result they retaliated. 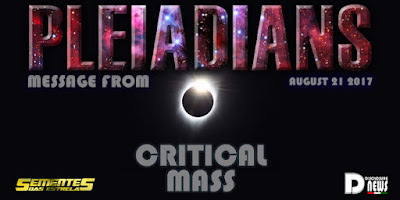 The critical mass guaranteed the formation of an immense Pink Light Vortex that swept the entire planet and radiated throughout the Solar System. The vibration of the Unity achieved by the dedication of souls of the Earth, fosusssed and with great love, caused that vibration to reach the 13th Dimension definitively attracting the eyes of the CENTRALS and the total support to the desire of the unified humanity to achieve its leap. 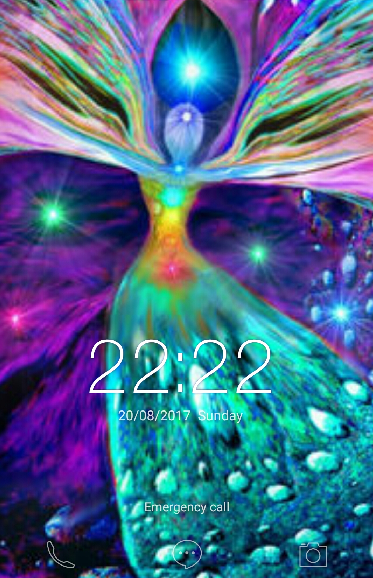 The Yaldabaoth entity has been drastically affected by a crystalline wave thus reducing by half, one can say, the time until the manifestation of the programmed Event. We have reached the critical mass! I will release a full report in a few days, and it will contain very good news. Greetings on this Solar Eclipse day. 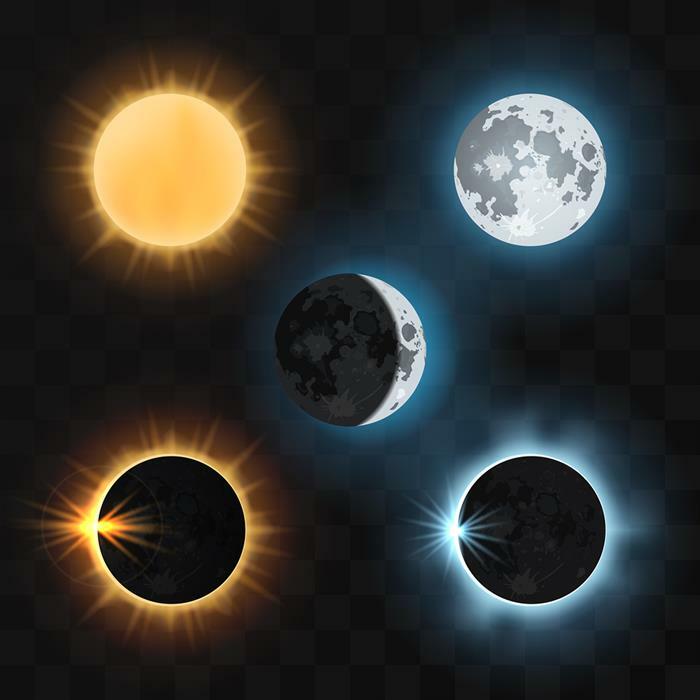 The eclipse begins in a little over an hour from the time of posting this, and reaches its maximum at 18:25:35 UTC (which for some of us will be the early hours of August 22) with the ‘central focus’ of this eclipse toward the continental USA. 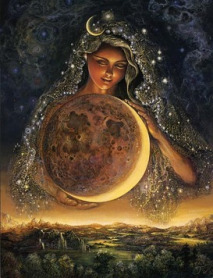 From a vibrational perspective, solar and lunar eclipses are catalyst points for releasing ‘shadow’ energies from the collective and individual fields of consciousness, and for aligning and anchoring higher energies. As the shadow of conscious and subconscious thought-forms, limiting beliefs and programmes symbolically and vibrationally peels away, there is always a focus-point of potential to align higher, individually and collectively. If you would like to join in a LoveLight Circle meditation for the solar eclipse, there’s a meditation and affirmation posted at this link. Whatever focus you can give from your Heart of pure Love, Peace, Unity and Compassion all helps to build the momentum, beautiful friends…and know that many Beings of Love and high Light are focusing their energies with us across the dimensions. Flights of Condors intertwine with Eagles. 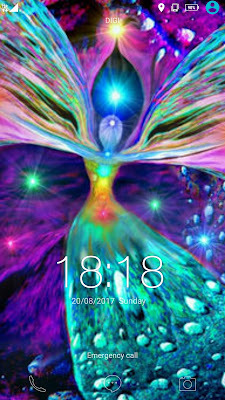 Cosmics align with the meeting. Stellar manipulations come to an end. 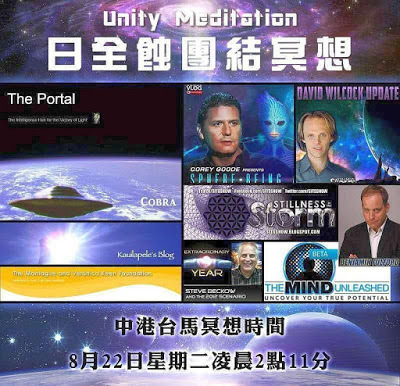 James Tyberonn's site is Earth Keeper, and he's onboard with the Unity Meditation, posting Cobra's link and meditation details in this latest newsletter! This came via email, and I will post the complete message here; excuse formatting, I'm limiting my time online today. Dear Humans, nothing occurs on the 'Planet of Duality' which is not over-viewed by that termed 'divine'. Accordingly, it is no random astronomical occurrence that has attached an unrealized, and indeed unimaginable divine coding to this rare total eclipse which will sweep across the heartlands of the United States. Seeded in the light are crystal codes, both of Divine Source, and of higher human desire of noble intent. Clearly, there is an ongoing turmoil on the planet. 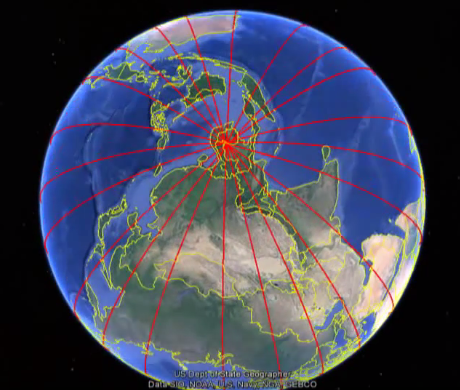 As we have shared, the crysto-magnetics are shifting, and this in terms of polarity physics, is in part the mechanical driver enabling the 'Pandora's Box' scenario now taking place. Be aware there is a method to the seeming madness. It is in effect...the requisite 'lancing of the boil'...the cleansing. Your Edgar Cayce predicted many decades ago, that unless the current world powers & 'western' 1st world governments become more equalitarian in their care of all people, of all 'citizens of the earth', then 'planetary-power' would shift. He also stated that from 'Russia would come the hope for the world'. Insert: According to author & Director of the Edgar Cayce Foundation, John Van Auken, additional Cayce readings indicate that in time China will come to represent altruistic values, based upon the higher tenets of freedom and (Buddhist & Christian higher spiritual aspects), and that unless the 'western' governments of the world change to support all people, then the fulcrums of world power will move into areas of the world for a new start, based upon a better format of caring & fellowship, one to another. Please take note, as we repeat emphatically... in the present time, the planet of duality is in a very unique timing. 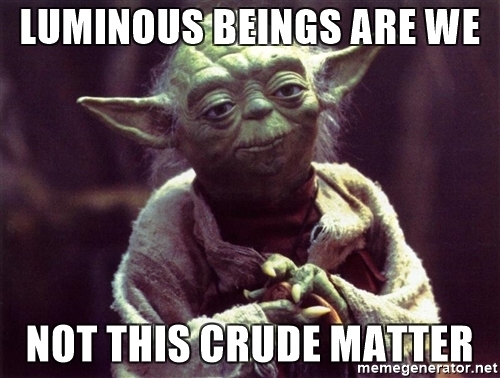 Planetary influences have combined with cosmic forces, which are not normally associated to astrological gravities to create a unique and succinctly intense purging in the paradigm of the New Earth. This is quite obvious, is it not? That termed the shadow, the darkside is in a temporal free-flow for a peculiar period of frequencial time to bring to the surface repression and frustrations, whether justified or not, to be confronted, viewed and dealt with in the crucible of human experience and mankind's current manifest reality. That which was hidden or repressed is being percolated to the top. Past transgressions and unresolved conflicts that may have been hidden will surface in this time for facing and responsibly clearing. It is a time of misunderstanding, of over-reaction and illusion. It is an energy underscored by extremes, in inappropriate expressions of repression, a backlash of frustrations that may be revealed in an unjustified explosion of untoward venting in releasing that which was in 'shadow'. Yet we assure you that the event of this eclipse equally offers an opportunity for the savant among you to 'directly influence' the pattern of requisite purging, in free will, to highest good, into the better course, and it is indeed incumbent upon you to do so. These have surfaced many times before without resolution. However in the energy of the New Earth, such issues will not just go away. In the energy of your 'present' linear time, such conflicts will absolutely percolate to the surface and remain there until they are confronted and justly settled. Many of these are dramatically emotionalized due to past repression, but the core issues must surface and must be faced. When such challenges arise, another round of what may be termed ' resolution therapy' begins in temporal rhythmic patterns...albeit in this case, a continual rhythm. Masters, conflicts & issues of human equality cannot be treated with a quick-fix medicine or a safety-valve treatment of letting off 'steam'. Equality and justice must become ideals that are actualized in the New Planet Earth. Although opposites (and as such dark energies) exist in duality, good and evil in your terms are purposed illusions. From the higher stance above polarity opposites do not exist, and everything is part of and leads to the greatest good. Earth is a testing ground, and although the experiences you have in duality are very real to you, such essential lessons are designed for your development of co creatorship. You are learning & growing. Each of you are being taught, and you are simultaneously learning to optimally manage energy in order to become conscious co-creators with 'All That Is', Creator God in your terms. One of the "stages of development" or learning processes in the University of Duality includes dealing with opposites as realities, with good and evil. And because these opposites exist in duality, it is requisite that you choose 'good' in the path of love. Do not misunderstand, darkness must be confronted and light ever prevail... and although above duality good and evil do not actually exist in higher realms, they are indeed actualities of 3d, as conditions of existence in your system of reality. In rather simplistic terms, concepts of good and evil will in time serve to teach you the sacredness of existence and the responsibilities of consciousness, and provide guidelines along your path. Do not forget that the planet of Free-will, the University of Duality, is a purposed illusion, a credentialed course in which you enrolled to learn the art of responsible co-creation. If it did not feel real, you would not learn....indeed the pain and the joy experienced are real, and are you're created manifested choices, but probabilities eventually lead to ascension. We assure you that a new sun has dawned, and it is indeed the sun of change. It brings the light of the magnificent New Earth. And Dear Ones, we do mean magnificent. In this new era, it is incumbent upon the seekers to project joy, to project light, for in the expansion to Crystalline Harmonics, every photon of mental light you project is exponentially amplified. This occurs more rapidly in the New Energy of 2017 - 2020- 2038. So your roles take on a new importance, a greater benevolence, as your creation powers increase in that termed the Aquarian Shift. Masters, Eclipses are multidimensionalapertures that combine light, planetary frequencies, geo-gravities and collective thought. Eclipses offer a unique pallet for both Divine Thought and higher vibrations of Human Collective thought to be imprinted. A lunar eclipse can only occur on a full moon, and a solar eclipse can only occur on a new moon. Both succinctly define & add unique patterned potency to the eclipse. Eclipses are often viewed by humanity as singular events, but we would tell you otherwise... lunar and solar eclipses are ever in direct linear sequence, and are thus, a singular frequencial event, far more layered, far more complex than you currently recognize. Eclipses emit a 'percussive' energy wave of coded coherency that permeates the earth and affects humanity. Coherency opens the pineal and elicits a specific response from both the cells of the human body physical and the energy construct of the etheric body. In a manner of speaking time as you know it is altered during the phase of eclipses, especially when both a lunar and solar occur within a relative proximity to apexial points of solstices and equinoxes. This is taking place through 2017. And while it creates intensities, it also opens extraordinary 'dimensional doorways' of consciousness. Dream states are more lucid in these rare phases, and altered states within waking consciousness are also differentiated. The pulse of thought, of life force is varied in subtle but very meaningful ways. Windows of reality are opened, horizons of beingness are extended. 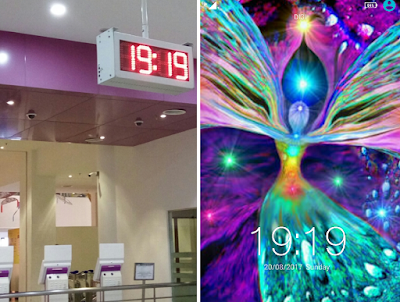 Space-Time is briefly changed. Higher states of 'Eternal Now' simultaneous time are enhanced, allowing for a truly embellished phase of multidimensional clarity. 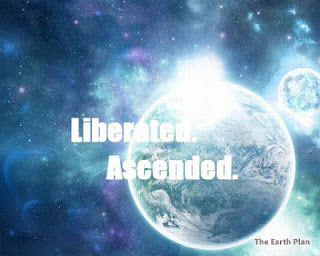 You are aware that 'sacred sites' are planetary powernodes within vectors on the earth embellished with a greater concentration of life force units... (Also referred to as Adamantine or Akashic Essence). Eclipses emit for a period of time a concentrated wave-stream of creative life force particulate. This energy bombardment can be seeded with inserts of 'Divine' pattern thought as well as the higher intent of humanity on both the conscious & unconscious level. This energy will affect all of you on some level, to varying degrees whether or not you realize it. But how you utilize it, whether consciously or unconsciously will depend on your focus, knowledge and light quotient. 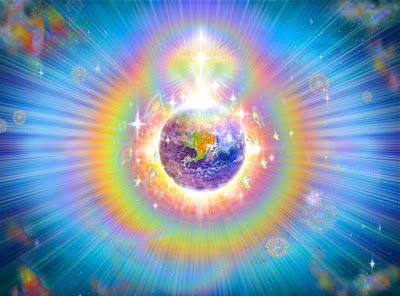 Archangel Metatron: Human biology and indeed the mental and emotional fields are absolutely influenced by the dimensional & human mind collective environs of the Earth. Your environment includes far more than you consciously perceive, including gravity waves, light frequencies, ionic ratios and mineralogical vibrations of the planet. 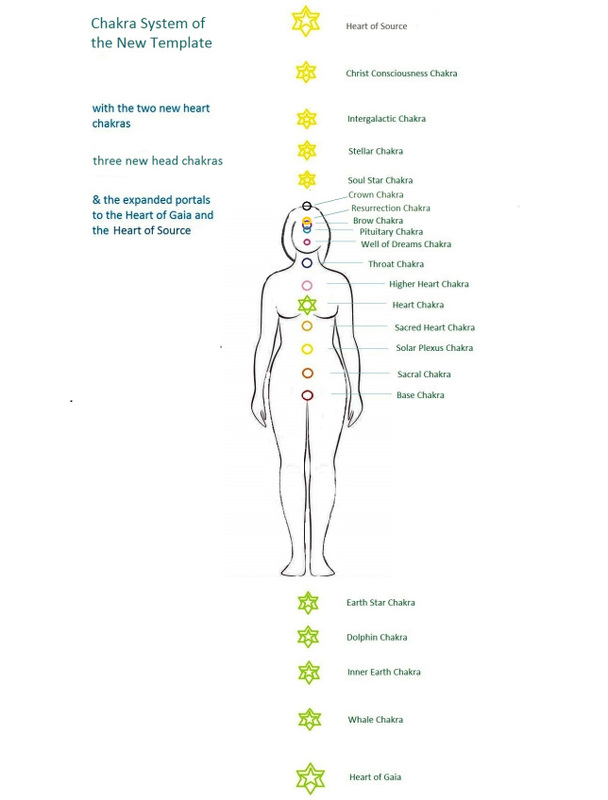 Your physical body has a cellular consciousness operating biologically, so that hormonal and bio-chemical balances are directly affected by the light format & matrix of the planet. Eclipses have an impact because they project differentiated light, alter gravity and are coded with conscious life force that enables greater 'consciousness-interface'. Accordingly, a release as well as re-calibration can take place. All post 2012, eclipses are part of a greater 'whole'. All are coded. 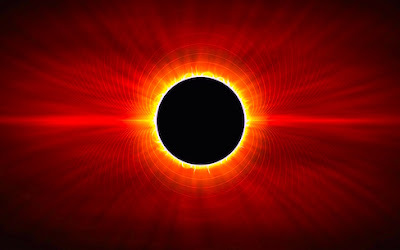 Therefore the mega eclipses of Year Five of the New Earth, of August 2017 are not only frequencially connected to the unique Eclipses of 2015 and 2014, but also to the potent eclipses to come between the present and 2020,up thru 2038. Those of you of Light will also be able to utilize the eclipsical energies on the planet for co creating the world of love, of Humanities Ascension. 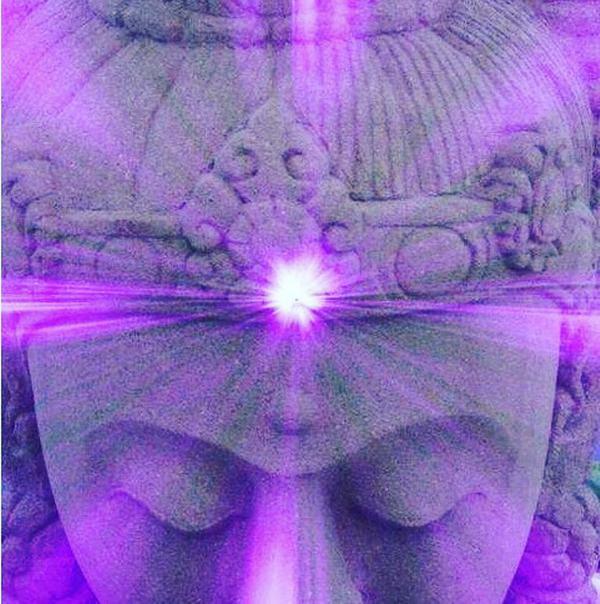 And remember that Ascension occurs one heart at a time...what you do individually and how each of you reacts adds to the collective. One candle can brighten the path for masses. Be the change, be the example !